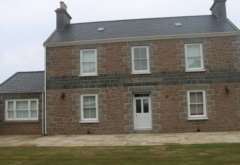 Situated in the Parish of St John this impressive dressed granite home that is available to non-qualified tenants and offer so much space. Superb 4 bedroom 3 bathroom detached home that is situated on a quiet lane in St John yet still close to restaurants, shops, local pub, dentist, doctors and minutes to town. Great size eat in kitchen with door out to garden.